Massachusetts Oyster Project: Shucked, Topped and Frozen Oysters From Australia??? Shucked, Topped and Frozen Oysters From Australia??? While we are sensitive to the shipping challenges of this group from Australia. Buying frozen oysters pre-shucked and frozen just seems odd. In the near-term they would solely be for the domestic Australian market. This article first appeared here. A South Australian shellfish company has begun research to start exporting frozen, pre-topped oysters interstate. Kangaroo Island shellfish is marketing the frozen oysters to retailers to make the most of the growing demand for frozen seafood products. Managing director of KI Shellfish, Ken Rowe, said developing the technology would enable the company to overcome its freight burden. Mr Rowe said the company was looking to redesign its business to overcome the cost of freight and discovered the potential in exporting frozen oysters. 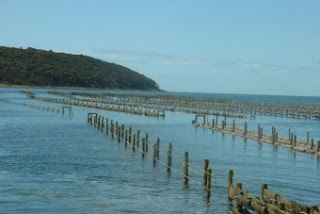 "We are the most southern South Australian oyster farm, so we do have a bit wilder weather and colder water and deeper tides, but we have a pretty nice product which we sell as a niche Kangaroo Island product," he said. "Freight is a massive issue. "When we want to send our product fresh around Australia, often we're hamstrung by transport businesses not running due to weather conditions and other challenges we have being an island." The company plans to harvest and stockpile oysters during their prime before being frozen, dressed and shipped as a ready-to-eat product. KI Shellfish received a $20,000 State Government grant to develop a frozen product that stayed fresh after being frozen, but the concept was easy. "We're hoping, all going well, that it will be ready to eat," Mr Rowe said. "So you rip the lid off, you put your shucked and pre-topped oysters in the oven from a frozen product, and hopefully in 20 minutes you pull them out and impress your guests." Mr Rowe said regional areas which had trouble sourcing fresh oysters would be a key market for the frozen product. Another sought-out market would be Asia. There was still a lot of ground to make in research and development to create a retail product, Mr Rowe said, but the potential was certainly there. "There is a ready to eat frozen seafood growth market, so we are trying to put the oysters there," he said. "We've got a good chance at it being Kangaroo Island oysters, because we think it is well suited to be a niche, gourmet product."